When OnePlus says its phones are flagship killers, we obviously compare them to the likes of Galaxy S8. But for Samsung, that might be a double-edged sword. Many would agree that the Galaxy S8 is a better “flagship”, but it's tough to deny the value proposition a OnePlus 5T has to offer. Hence, the Galaxy A8+. For all intents and purposes, the Galaxy A8+, like its predecessors, is a toned down flagship. It comes with compromises, but it's an excellent phone in many regards. The Samsung A8+ released in India on January 10 and it goes on sale from January 20 onwards. It is priced at Rs 32,990, and the device will be exclusively available on Amazon.in for online sales. Face up, the Galaxy A8+ looks very similar to the Google Pixel 2 XL. The 18:9 display and the frame around it, look nearly identical. That said, the phone follows Samsung's glass and metal design language. It also has a rectangular fingerprint sensor, placed below the camera on the back. If you're imagining the Galaxy S8's camera/fingerprint scanner setup vertically, you're on the right track. While this is distinctly easier to get used to, it was more difficult to get used to than circular scanners on phones like the OnePlus 5T. The phone did end up missing fingerprints a few times. It's not a glaring fault though and we did get used to it eventually. Samsung's going for premium looks here, and at that, it succeeds. The glass body shimmers in the night, which is strikingly different when compared to the Pixel 2 XL. The glass back felt somewhat sticky, which keeps it from slipping out, but makes it fingerprint and sweat-intensive. The design is not only premium but also quite solid. A glass body is, of course, prone to cracking, but the A8+ feels like a well-built smartphone in your hands. If you see this phone at an offline store, you'll probably fall in love with it on first look. It's got a flagship-feel to it, which the OnePlus 5T lacks. If the design was the only concern, this is a better competitor to the Mi Mix 2 than the OnePlus 5T. The Galaxy A8+ has a 6-inch 1080p 18:9 display, with 2.5D curved glass on top. As a result, the display seems to merge into the frame, giving it an immersive and a premium feel. It's also bright and colourful, something Samsung's AMOLED panels have been known for, albeit noticeable (but pleasantly) oversaturated. Like many Samsung smartphones, this phone is meant to impress on aesthetics. Samsung evidently wants your buying decision to be based on the display and design, which complement each other quite well. The idea, it seems, is to have the user so impressed with the exterior elements, that you overlook the phone's visibly slow performance. But more on that, later. 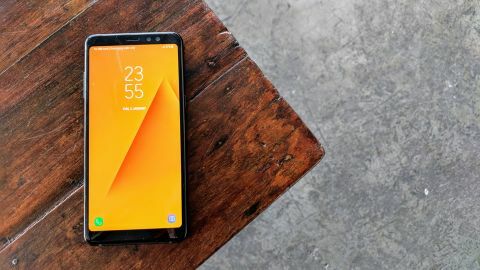 As a standalone display, the Galaxy A8+ has a great one. It matches the 5T in terms of colours, but the 5T's display seems more evenly lit than the Galaxy A8+. The latter is slightly dark near the edges and just slightly dimmer overall. You will, however, see this only when you compare the two devices side-by-side.